We have come to the mid-season of the Basketball Spotlight Road To The Grand Finale. The 8th Grade Division has been a total joy to watch. 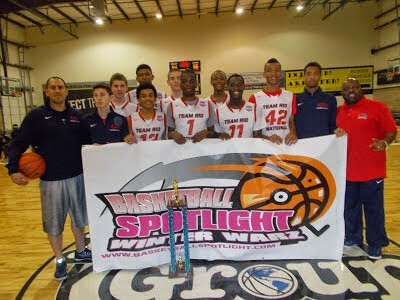 Here’s our mid-season 8th Grade report from the Basketball Spotlight Circuit. Winter Warz was their first Spotlight event of the year but the way they breezed through was scary. They seemed to be playing at a different speed and effectiveness than the opposition. A good showing at Atlantic City would likely punch their ticket for the Grand Finale. They are deep, talented and battle tested. Which means they might be hard to beat anytime soon. The Jets entered the circuit virtually unknown outside of the Big Apple and quickly made a name for themselves. They won the Tip Off Classic and made it to the finals of Winter Warz. They are currently leading the circuit in Grand Finale points and will be looking to add more in America’s Playground. They are no longer a secret. Formerly DC Premier, this group has the talent to win it all. They won the Clash For The Cup crown but has been on the sideline since that event. Their next stop is Atlantic City where they will bump with the big boys. A good run in AC will launch them into the Grand Finale which will be a local event for these guys. Anthony has appeared in the first three Spotlight events and has put up serious numbers. He has shown he could score the rock from all three levels and has improved his ability to make his teammates better. Leading the NY Rens to a Championship might help take him over the top. Antoine performance at Winter Warz showed he has separated himself from his peers in the region. He showed the complete package from the perimeter and driving to the cup. His feel for the game and fluid motion will make your mouth water. Oyekanium is a high motor forward and put up tremendous numbers on the Spotlight circuit. He proved to be a constant matchup problem by either being too big or too quick for the opposition. I can’t wait to see him in Atlantic City. He didn’t take home a championship yet but you have to admire what Cross has done with this newly formed squad. They seemed to have gelled together quickly and figured out their roles. The former Coach of the Year seems to be working his middle school magic again. A reserved guard last season Roberts has the keys to the engine this year with Newark Pharaoh. The scoring point guard has shown good skills against some of the top competition in the region. He refused to back down and always gives his team a shot to win. Wenn showed that his presence matters. He ran the point for the Jets as they won the Tip Off Classic and placed runner up at Winter Warz. His heady plays and ability to score or run the show takes this NYC squad to the next level.